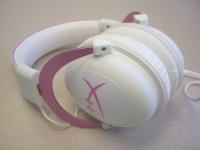 The Kingston HyperX Cloud II gaming headset is shipped in the configuration shown below... The boom microphone is not attached, and the leather like earcups have been pre-installed. The combination of the earcups and the headband look great and are very comfortable, even for extended sessions. 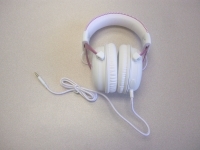 The bulk of the surfaces are white with pink accents, and even the cord is included in the color scheme with its soft braided covering. You get a good look at the two earcups in the images below, where we can see that the bodies are plastic, while the brackets that attach them to the headband are made of metal. 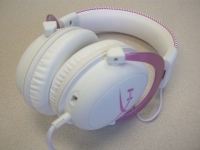 The one meter long audio cable connects to the left earcup, and a shorter cable then connects the right earcup to the left. The below right image also shows that the small "dust cover" has been removed from the jack for the boom microphone. I would prefer that this little flap of rubber was attached (perhaps hinged) to the earcup so that I can't lose it, but never the less it provides a way to protect the jack when you are not using the microphone. 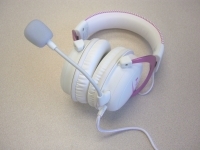 The promo image below shows the microphone about to be attached to the headset. The microphone just pops on (see the below left image), and stays put rather nicely. The boom is flexible, and I found that even with my oversized head I could find a comfortable spot for the microphone to be both useful, and out of my direct line of site. 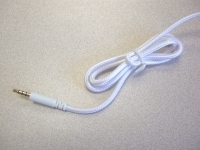 The above right image shows the audio cable, which is sheathed in a white rope-like covering. While I appreciate the attention to detail, I am concerned that this white colored, cloth-like surface will be filthy in no time. What we can also see from this image is that the plug has four distinct bands, which is one more than your usual stereo headset. The extra band is due to the microphone being routed through the same cable. This will work just fine with Kingston's USB adapter and with many mobile devices, but you will not be able to plug this in to a typical stereo jack and get the full functionality of the headset. You will have 2 channel audio only, without the microphone.